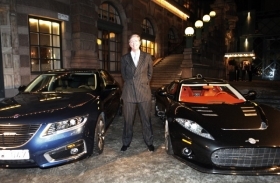 Spyker's Muller stands between a Saab 9-5, left, and a Spyker C8 Laviolette after the deal for Spyker to buy Saab was announced. MUNICH -- The success of the audacious bid by Spyker Cars NV to buy the iconic Saab brand has met with skepticism from many inside the auto industry including Fiat S.p.A. CEO Sergio Marchionne. Alluding to both Saab and Spyker, Marchionne said that being a profitable niche player is extremely difficult. "Marginal players will continue to be marginalized. We cannot build on hopes and dreams," Marchionne said at an industry event in Stockholm on Tuesday. His comments came a few hours before Saab parent General Motors Co. and Spyker announced a deal for Spyker to acquire Saab. Last year, Marchionne saw synergies between Fiat's money-losing Lancia brand and Saab and included the Swedish carmaker as part of Fiat's offer for Opel in May, a bid Fiat withdrew when GM asked the Italian carmaker for cash. Fiat also bid for Saab in 1989 but was beaten by rival GM, which snapped up a 50 percent stake in Saab. GM took full ownership in the Swedish brand in 2000. Doubts about whether the new company, Saab Spyker Automobiles, can survive center around the fact that neither company is profitable, and around Spyker's tiny size -- the Dutch carmaker employs about 100 people while Saab has about 3,400. Nick Margetts, a Germany-based analyst at JATO Dynamics, said: "It would be nice to see it survive, but it would be a first for a brand of Saab's size to go in the hands of a company that is not a major player." Margetts said Saab could be too big for Spyker, which makes about 40 200,000-euro, hand-made supercars a year. "Spyker knows about cars but they play in a different league," he said. The new Saab Spyker Automobiles faces the huge challenges of persistent losses, outdated designs, high labor costs and declining sales. "It seems like a gamble. They've got the new 9-5, the 9-4X coming out next and the new 9-3 should be coming out in 2012, which could be quite lucrative, but whether they can attract customers back to the brand and make it profitable again is the billion-dollar question," said IHS Global's Ian Fletcher. One thing the Saab and Spyker have in common is that neither makes money. Since Spyker was resurrected in 2000, it has not made a profit. Spyker lost 8.7 million euros in the first six months of 2009 and its sales fell by 1.6 million euros to 4.1 million euros compared with the year before. Saab has lost money for GM over the past decade. Saab lost 400 million euros last year on sales of 1 billion euros, Spyker said. Saab's new-car sales fell to 39,903 cars from 94,751 in 2008 and production dropped to 20,791 cars from 89,086. Spyker, which has a market value of less than $85 million, is taking on a big financial commitment. Spyker said it will pay GM $74 million in cash -- $50 million by Feb. 15 and the rest by July 15 -- in addition to $326 million worth of preferred shares in the merged company. The shares represent less than 1 percent of Saab Spyker's voting rights, the company said. The Swedish government also has agreed to guarantee a European Investment Bank loan valued at about (400 million euros) $563.5 million. European Union regulators said on Wednesday they would review as early as possible the Swedish plans to guarantee the loan. Spyker also took out a backup facility of 150 million euros with the GEM Global Yield Fund, part of Global Emerging Markets, a $3.4 billion alternative investment group. Spyker CEO Victor Muller said in an interview with ANP and Reuters on Wednesday that the company "absolutely" had the financing to bridge a three-year development cycle for new Saab models. He also denied reports that Spyker would draw on some of the EIB loan, saying all of it will go directly into Saab. The irony of the David-and-Goliath deal was not lost on Muller, a 50-year-old former fashion executive who engineered Spyker's relaunch at the 2000 British motor show. "Under normal circumstances, probably Saab would have been buying Spyker," an exhausted Muller told a news conference in Stockholm. He said he had had no more than 15 hours sleep over the past 5 days of marathon talks. Muller admits that Spyker faces a big challenge to turn around Saab. "We have a lot of work to do. For a moment, we are going to celebrate," he told Automotive News Europe on Tuesday after the deal was announced. He added: "There were so many things at work here. It was such a complex deal -- trying to take a company that was part of General Motors for 20 years and carving that out as a different business. It was a massive exercise and a lot of different issues." In an interview with ANE in December, Muller said Spyker will give Saab the financial backing required to compete as a competitive global brand, along with an entrepreneurial leadership team sensitive to the uniqueness, heritage and individuality of the Saab brand. Spyker will take Saab back to its roots as the premium brand of choice for free-spirited car buyers who want to stand out from the crowd, Muller said. "We can add managing skills to help Saab rediscover independent brand development for an alternative premium product, something they used to do many years ago," Muller told ANE. John Smith, GM vice president for corporate planning and alliances, said GM will continue to support the new Saab-Spyker company, building the brand's new 9-4X crossover in Mexico and providing powertrains and engineering expertise. "We want to see a strong Saab," Smith told reporters in a conference call Tuesday.